Objectives: The aim of this prospective study was to evaluate clinically the success and esthetic result (soft-tissue and hard-tissue changes) of immediate implant placement after 1 year. Materials and Methods: Eighteen patients with 23 titanium screw-shaped implants (13–16-mm length and 4.3–5-mm diameters) were placed in the extraction sockets. The jumping distance after implant placement was filled up with G bone synthetic hydroxyapatite granules and platelet-rich fibrin. It was again reevaluated at second-stage surgery. 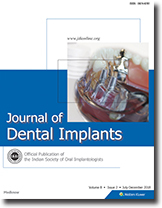 Clinical parameters of the peri-implant conditions were assessed after 1-year follow-up. Statistical Analysis: Statistical Package for Social Sciences (SPSS) for Windows, Version 22.0. released 2013. Armonk, NY: IBM Corp, was used to perform statistical analyses. Descriptive Statistics: It includes expression of the study variables with categorical data regarding number and percentage whereas in mean and standard deviation for continuous data. Results: The cumulative implant survival and success rate were determined after 1-year observation period. The analysis of the esthetic result, papillary index, interdental bone, gingival biotype, modified plaque index, and modified bleeding index was analyzed. Conclusion: This study determines us the success rate and esthetics of immediate implant placement after tooth extraction. Introduction: Factors that affect primary and ultimate implant stability include characteristics of the type of dental implant used, bone quality at the site of implant placement, insertion torque, as well as micromotions at the bone–implant interface. This study, however, sought out to determine the effect and relationship between relevant implant characteristics and implant stability in immediately loaded single implant cases using the Periotest® M handheld device. Aim: To determine the effect of implant characteristics on the ultimate implant stability in immediately loaded single implant cases. Results: At placement, 33 (94%) of implants had periotest values between −0.8 and 0 at placement. There is a general decrease in the number of patients with periotest values −0.8–0 and those with +1–9 from the initial placement to 6 months after placement. It was further observed that there is a negative correlation between the implant length, diameter, and the mean periotest values although this was not statistically significant. Conclusion: There is a directly proportional relationship between implant characteristics and implant stability of immediately loaded implants. 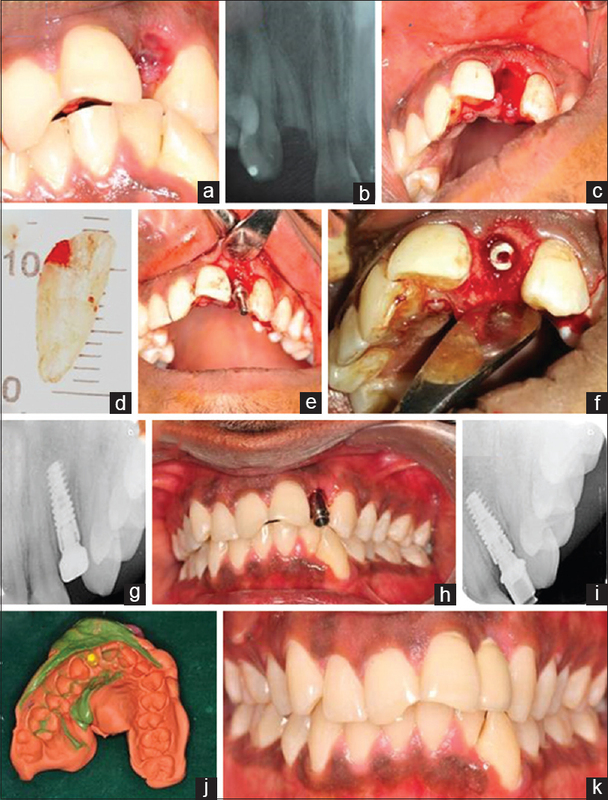 Objectives: The goal of this study was to evaluate the effect of using prefabricated stress-free implant bar (SFI-Bar) on marginal bone loss around tilted or axially placed and immediately loaded two implants for retaining mandibular overdentures. Materials and Methods: Thirty patients with a mean age of 56.5 years were chosen. 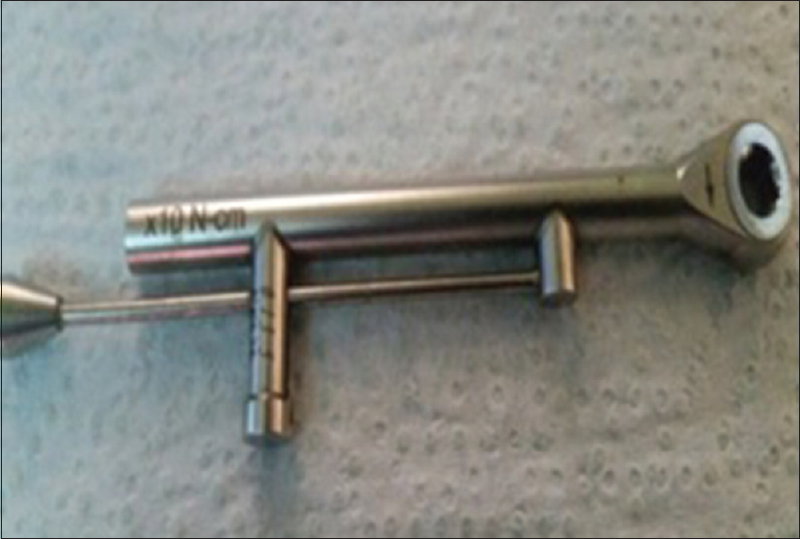 Patients were divided into two groups as follows: Group (AB) (n = 15): Patients received two axially implants connected by SFI-Bars for retaining mandibular overdentures. 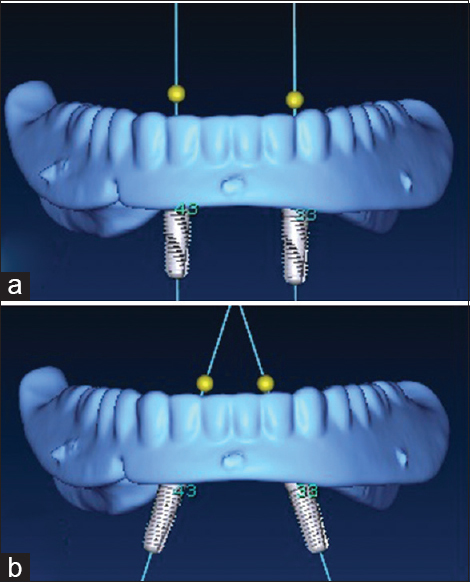 Group (TB) (n = 15): Patients received two mesially tilted implants connected by SFI-Bars for retaining mandibular overdentures. For each patient, two dental implants (3.8 mm × 12 mm) were bilaterally inserted in the canine regions. Implants were immediately loaded with SFI-Bar system overdentures. Digital periapical radiographs were scheduled at implant placement (baseline) and subsequently after every 12 months up to 36 months to measure peri-implant bone loss (PiBL). The recorded data were subjected to statistical analysis. Results: Both groups showed insignificant PiBL at 12 and 24 months, while at 36 months, patients in Group TB showed significantly higher marginal PiBL than that with Group AB. 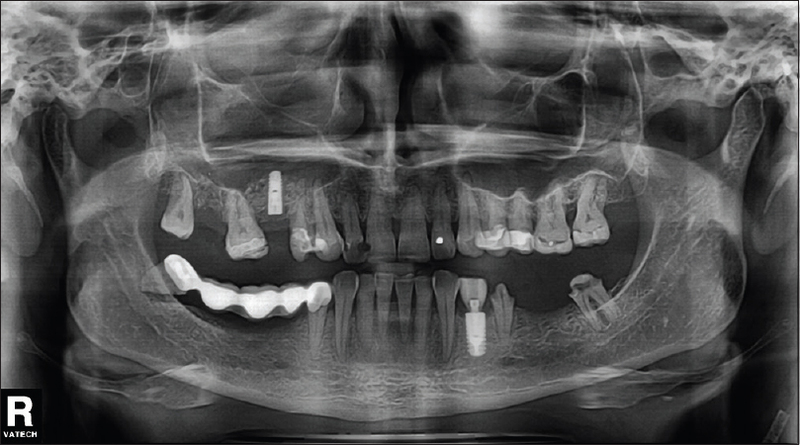 Conclusions: Prefabricated SFI-Bar retained mandibular overdentures could offer an alternative attachment for two angulated, immediately loaded implants with predictable radiographic outcomes. Allograft bone blocks are tried and tested procedure to gain bone width so that an implant can be placed in cases with deficient bone width. It is a simple and easy technique. 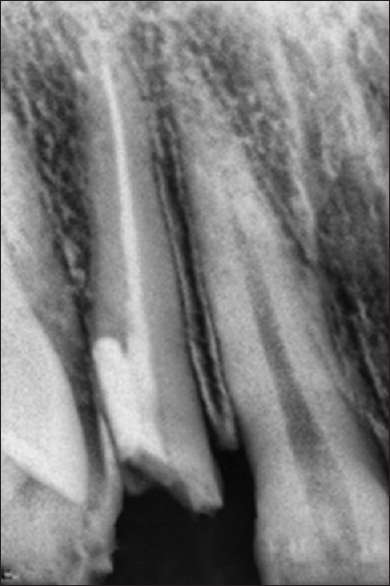 This article presents a case with deficient bone width in the anterior maxilla and the technique that was used to gain the desired bone width with successful placement and loading of dental implant. Cold welding is a very useful mechanical effect in dental implant therapy when abutments are fixed. However, this effect may cause very challenging situation for the clinicians when occurring in the “wrong place, wrong time.” The incidence of cover screw complications was reported to range 0.5%–8%. According to our investigation, this value may be even higher when conical design present. Although some manufacturers offer so-called retrieval kits, in some cases, these are very time-consuming and not always effective, and when the complication occurs, the planned dental implant therapy could be in danger. This article summarizes a case report when the conical connected cover screw affected from cold welding was removed with a carbide bur. Implant stability reflects implant osseointegration in that it requires certain objectives to be met during implant installation and healing. The main determinants of implant stability are the mechanical properties of bone tissue at implant site irrespective of how well the implant is engaged with bone tissue. Stability can be classified into two types as follows: primary stability that is measured immediately after implant placement, secondary stability which is measured after the healing of bone around the implant. Primary stability is a mechanical phenomenon, whereas secondary stability occurs through a cascade of events, such as bone deposition and remodeling at the bone implant interface. Many factors influence the primary and secondary stabilities of the implants which include implant design, implant surface topography, bone quality, and patient-related factors. Hence, it is essential to comprehend the multitude of factors that persuade the implant stability and to analyze the outcome of implant therapy.